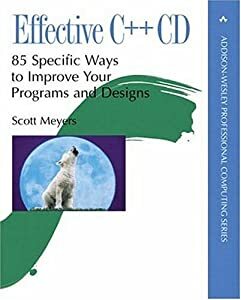 In 1999, Addison-Wesley and I collaborated on a CD version of two of my books, Effective C++, Second Edition and More Effective C++. The CD was designed for contemporary browsers--contemporary to 1999. That was a time of rapid browser evolution, and it wasn't too long before browsers "progressed" to the point where the CD content didn't display correctly. In 2003, Ian Roberts described how the content could be modified to work with IE6, and I published a program to apply his fixes to the files on the CD. A few days ago, I got a message from Yong-guang Teng telling me that he'd come up with a shell script that permits the CD content to display better on current browsers. He's posted the script as a comment at the Amazon product page for the CD. Be sure to check the comment on his comment, because it tries to compensate for some text-mangling that apparently took place during Amazon's processing of his script text. I haven't tested his script, so I don't know how well it works. And I don't advocate you buy a copy of the CD, because even if the content can be made to display perfectly with modern browsers, the content itself is still nearly 15 years old, and the second edition of Effective C++ has been superseded by the third edition. Still, Yong-guang Teng found it useful to breathe new life into the CD he bought many years ago, and perhaps you will, too.